The guided curriculum will focus on the theory and practice of water sustainability and security as it applies to California, with direct field experiences throughout California (June 18-30, 2017). In addition to receiving academic credit at any of the four campuses, students will directly benefit from visiting select locations featuring California’s infrastructure, such as Shasta Dam, Mono Lake, and Hetch Hetchy Valley. Students will meet with institutional and policy leaders as well as gain direct research experience by working with UC Water faculty. Student projects will focus on communicating important California water issues to the public stakeholders. 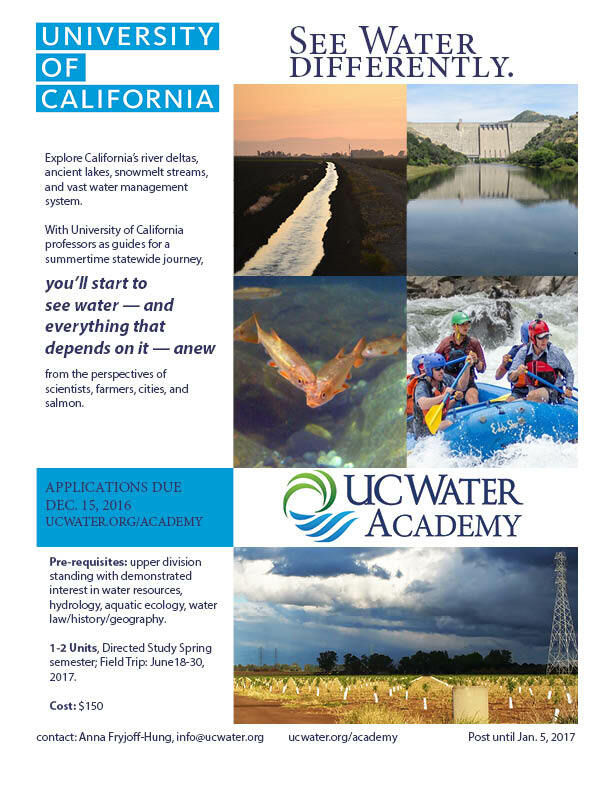 The UC Water Academy is a great way for University of California upper-division undergraduate and first-year graduate students to learn about water resources, management and law.